Rotork is well known for supplying flow control equipment for new and upgraded industrial plants and processes on a global scale. In these contracts, often involving tens or hundreds of valve actuators and associated control equipment, Rotork works with valvemakers, engineering companies and end users as one of several members of a project team, each with different areas of expertise and generally all under the supervision of a main contractor. Another part of Rotork’s activity involves actuators that are retrofitted on site as part of improvement projects which often also include additional work such as mechanical, electrical and civil engineering. The members of Rotork’s dedicated Site Services Division have many years experience of these projects, enabling them in many cases to organise the total supply of the work that is required together with project management services, embracing all of the project team disciplines in what is called an extended scope contract. A major benefit for the customer is the simplified contractual route that the extended scope contract enables, by reducing the number of separate sub-contractor contracts. Extended scope contracts have become particularly popular with customers in areas including water, power and environmental improvement, where projects can be relatively modest in scale but still demand a diverse range of engineering skills and disciplines. A recent Rotork UK contract for the Environment Agency at the picturesque village of Buscot in Wiltshire is a good example. Buscot Weir prior to the upgrade. 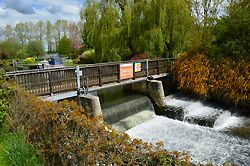 For many years Buscot Weir on the River Thames had been equipped with electric motors that were used to adjust the position of two sluice gates in order to manage the river level and flow rate during fluctuating weather conditions. These motors, with the associated valve shafts and an electrical control panel in an adjacent building, had become obsolete and required replacement to safeguard the river banks from potential flooding in the future. As well as replacing all the obsolete equipment, the Environment Agency wished to ensure that future inspection and maintenance could be carried out safely. To achieve this it would be necessary to construct a new access walkway platform along the length of the weir. 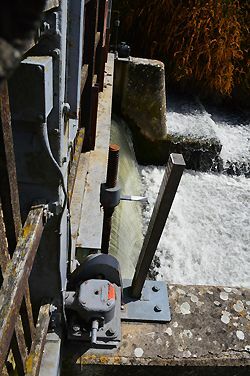 Close-up of the obsolete sluice gate motor drives. Following the preliminary site survey of the existing installation, Rotork Site Services submitted a contract proposal to the principle contractor AMCO Engineering which encompassed project management services and the total supply of all the elements of the project – new valve actuation, valve adaptation, wiring and control panel, new walkway platform, removal of old equipment, installation of new and commissioning. Upon acceptance of the proposal, Rotork engineers returned to site to carry out a detailed survey to enable the replacement equipment to be dimensioned, designed and fabricated and to organise all the other equipment needed for the installation work such as scaffolding and temporary access. In this case it included the provision of pontoons by a company that specialises in safeguarding working environments when the presence of water is a potential hazard. Installation nearing completion on the new walkway platform; the IQ3 actuator in the foreground is fitted with its vandal-proof cover. Rotork’s design team was able to replace the two existing electric motors with a single IQ3 electric valve actuator to operate both sluice gates simultaneously, driving through a combination of new shafting and three gearboxes supplied by Rotork Gears. The IQ3 actuator is certified as watertight and temporarily submersible to IP68, providing secure environmental protection for long term reliability in all anticipated ambient conditions. 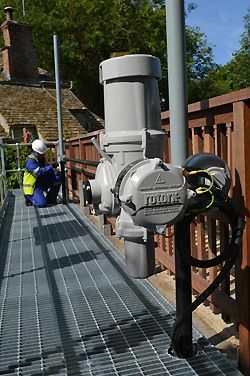 As the installation is adjacent to a public footpath, additional security is provided by the fitting of a vandal-proof cover over the actuator’s local control buttons to prevent any unauthorised operation or interference. Rotork Site Services co-ordinated the manufacture and fabrication of all the new equipment and materials required for the upgrade. When this was completed, engineers from Rotork and the sub-contractors were back on site to remove the old equipment, install the new actuator and valve shafting with control panel, wiring, walkway platform and all associated ancillaries, completing the installation and commissioning within seven days. 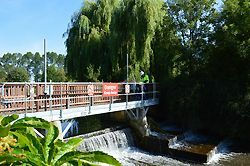 Buscot Weir after the completion of Rotork’s extended scope contract, which encompassed project management, new valve actuation and adaptation, a new control panel in an adjacent building and the installation of a new walkway platform for inspection and maintenance.